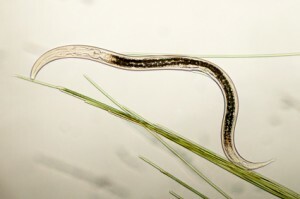 At present, cells, drugs and even animals can respond to wireless signals thanks to the invention of Pralle’s nematodes. Since then, the confluence of nanotechnology, biology and radio physics – is proving to be a powerful research tool creating a new kind of science. Not more than a millimeter long, Arnd Pralle’s nematodes look just like small worms controlled by a magnetic field. When he switches on a magnetic field, the nematodes moving to and fro halt for a moment and then after a pause, go into reverse. He turns the magnetic field off and on again and the tiny creatures dance to his tune, moving back and forth in perfect motion. These are called remote-controlled worms. At the State University of New York in Buffalo, Pralle and his colleagues have implanted nano-sized receivers in the nematodes’ brains. Whenever there is a high-frequency magnetic field, the neurons get fire and the worms start moving back and forth. Pralle’s nematodes are just the beginning in the field of nanotechnology for wireless medicine. Biologists are now in search of other hosts. They are successfully implanting receivers in DNA strands, ion channels and antibodies. They aim at taking charge of living cells using little more than radio waves. This emerging field is proving to be a powerful research tool for the scientists creating a new kind of science. Whether you call it bioengineering or electromagnetic pharmacology, the researchers are increasingly involved in this new form of nanotechnology with endless implications. Powerful magnetic fields are already used as therapy for some illnesses such as depression. Bernardo Barbiellini-Amidei, a physicist from Northeastern University Boston, who organized a US National Science Foundation workshop on this subject last year, says that a new branch of medicine is in the offing. According to the latest research, any number of treatments based on gene therapy, immune system or even stem cell could potentially be controlled remotely. Remote-controlled medicine can offer an almost instant on-off switch, unlike conventional drugs that can take hours to take effect and linger in the body for long. “Nanoscale wireless systems have tremendous potential for medical therapeutics,” says Barbiellini-Amidei. Sarah Stanley of Rockefeller University in New York says, “Imagine using radio fields to trigger cells to supply therapeutic proteins that are costly or difficult to deliver by other means,” It is not hard to imagine a generation of drugs that would start to work when activated by a Smartphone app.